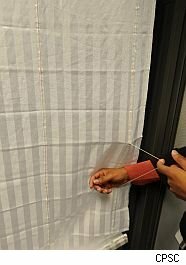 In one of the largest recalls in history, the U.S. Consumer Product Safety Commission is calling for the repair of nearly every roman blind and shade amid growing concerns over child strangulation. Tens of millions of these blinds and shades have been sold -- an estimated 8 million each year. The CPSC said it issued the recall after it tallied five deaths and 16 incidents of near strangulation as a result of cords wrapping around the necks of children. The blinds and shades were already being recalled by the million brand by brand. In fact, 5.5 million were flagged in August. The recalls are being conducted in conjunction with the Window Covering Safety Council, or WCSC, an industry group that has been active in demonstrating and offering solutions to help prevent deaths and injuries to children from the blinds and shades. The council said there have been about 200 infant and children deaths due to cords from window coverings since 1990. With these types of shades, strangulation occurred with the exposed cords on the rear. Children either poke their heads through the loops or can pull out the cords and wrap them around their necks. "Over the past 15 years, CPSC has been investigating window covering hazards and working with the WCSC (Window Covering Safety Council) to ensure the safety of window coverings," CPSC Chairman Inez Tenenbaum said in a written statement. "We commend the WCSC for providing consumers with repair kits that make window coverings safer and look forward to future steps to eliminate these hazards." The free kits can be obtained by going to WindowCoverings.org or by calling (800) 506-4636. Examine all shades and blinds in the home to make sure there are no accessible cords on the front, side, or back. Use cordless window coverings in all homes where children live or visit. Do not place cribs, beds, and furniture close to windows.